Now this is the home of, among other things, the Metropolitan Police Authority. 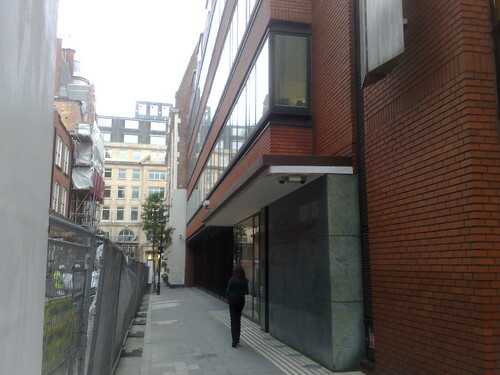 But in the spring of 1988 it was the first place that I went to work in an office in London. I’d just finished a few weeks at the Everyman Theatre, Cheltenham in the chorus of The King and I and I had no more work. My then girlfriend, later my wife, now my ex-wife… chivvied me (I think that’s the right word) into signing up for temp office work rather than “resting” – she insisted that I sign on with agencies and pester them until I got some work, any work, that would bring some cash in and stop me sponging off her. Damn! So within a week or so I was sent along to this building in Dean Farrar Street, just behind New Scotland Yard to work in the General Office of Cipfa Services Ltd – which had been a kind of research and consulting arm of the Chartered Institute of Public Finance and Accountancy before a management buy-out. I truly have very little idea of what the work was that they did there, although it was probably very close to work that I later did at the Audit Commission. All I knew was they produced reports, lots of them and they needed to be photocopied and bound and that was my job. I’d never used a photocopier before, but I quickly became a master of all its functions, dazzling my manager with stunning copying geek skillz – mainly because I think I was the first person to actually read the manual and think about what they were doing. Of course I also enjoyed being stationed opposite the typing pool For younger readers, I should explain that this wasn’t a swimming pool provided for staff to sit around with their laptops. No, this was where typing got done. Very few other people in the building had a computer on their desk, let alone their lap – and those that did would never have thought of using it for word-processing, that’s what the pool was therefore – about 10 young women who sat and typed from audio or manuscript and who would feel overworked if you asked for something with less than 24 hours notice. I stayed there for a while. They offered me a job. I turned it down to go to non-existent auditions for never-appearing acting work. I loved the non-commitment of temping, like I was a bit of an outlaw, not fully employed, but getting paid (£5ph!) and I really enjoyed doing a good job, quickly and surprising people with what could be done to make the reports look even better. I particularly loved pasting up pages that had charts on them. These were created by a separate team who had a computer and a plotter. The charts had to be cut to size and pasted (yes literally, with a pritt stick) into a space left by the typist in the middle of a page. Reworking reports was therefore horribly time-consuming and stress-making so many things would go out not quite right. The style of these reports were the inspiration for the first (and so far only) Tuttle Club Annual Report that I wrote 18 months ago. Previous PostHmmm…Next PostSo where to go and when?